As a tool dedicated to initial and continuing training in healthcare, MedicActiV is comparable to a library of virtual clinical cases. Students and professionals already working in healthcare sectors in all disciplines have access to cases developed by multi-disciplinary SimforHealth teams in partnership with healthcare professionals in training institutions with educational needs. Without any prior computer knowledge and in a totally intuitive way, a healthcare professional can create a virtual clinical case. The author selects a virtual patient (male, female, age, 3D environment etc. ), defines the stages of the consultation, submits the information needed to carry out the clinical case (medical record, clinical examination, treatments, recommendations) then the rendering of the clinical case begins. MedicActiV generates the virtual consultation by integrating all the defined data, rendering them in 3D and integrating the contribution of the speech synthesis and the conversational agent so that the consultation is closer to reality. If the clinical case is already drawn up, its virtual creation lasts only one hour. Once it has been created, the author can choose to publish it (or not) to learners in the MedicActiV library in private or public mode. In the latter case, any healthcare training institution or individual can consult the case*. 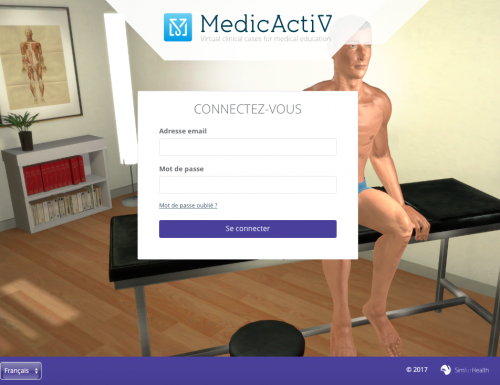 The MedicActive library is made up of virtual clinical cases which work on tablets and computers, including cases in cardiology developed by the University of Bordeaux, for example. For educational needs and the needs of various disciplines, virtual reality provides a solution with even higher levels of immersion and engagement. To meet these needs, MedicActiV has continued to develop by offering cases which work on HTC Vive, virtual reality headsets. To mark the launch of the authoring tool, a trial of the MedicActiV platform is available during 4 months. Consult, create and publish clinical cases free of charge! To take advantage of the launch offer, go to the platform access and create your account in less than 3 minutes. Previous Previous news item Our pitch in Stanford. What a great experience! Next Next news item New clinical case with Stanford, a vascular medicine clinical case using virtual reality.